Actually, I wanted to introduce you to this recipe last week, but things turned out differently than expected. 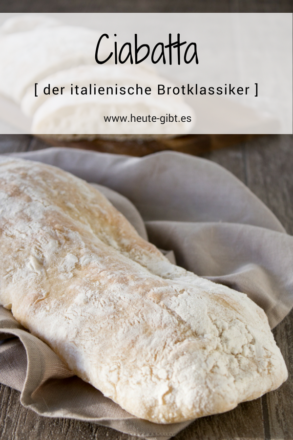 From the outset it was clear to me in planning the blog series on Italian breads that the classic race should not be missed: Ciabatta, Since I've never even baked white bread, I went in search for appropriate recipes and important information about the preparation. The upshot: It took several tries until I got a faithful, perfect in my eyes ciabatta. No way I wanted to publish a recipe that I personally am not convinced 200% here. I have learned through the failed attempts that baking this bread classic is a science in itself and we can leave here certain steps in no case or change, because then you indeed get a delicious white bread, but no ciabatta. 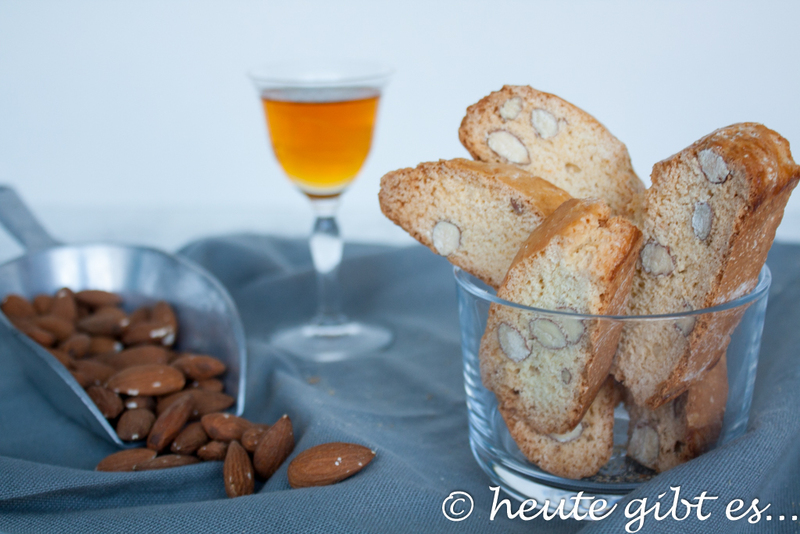 My experience gained from baking tests, tips and tricks included, so you do not have the same mistake I did, I want to share with you today. What is a (perfect) Ciabatta? 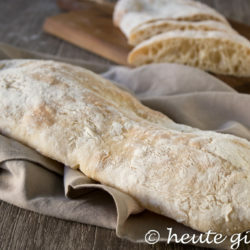 Who does not know that Italian ciabatta (pronounced “Tschabatta”)? A bread from wheat flour (its name in German “Pantoffel”) aufgrund seiner flachen, langgezogenen Form hat. Das aus der Region Venetien stammende Weißbrot ist genau richtig, wenn es eine dünne, knusprige Kruste, aber eine weiche, grobporige Brotkrume hat. 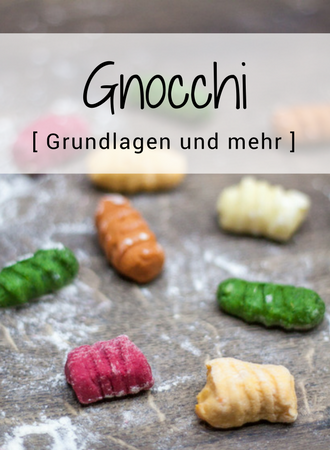 Von der Farbe her darf das Brot nur leicht goldgelb sein und hat aufgrund der Zubereitung auch immer stellenweise mehlige Stellen. Want a ciabatta like the Italians, then you need one thing above all: time. If you find a recipe for a quick version that gets under 3 hours, then let absolutely not touch it, because for the formation of large pores, the dough has to rise correspondingly long. I would not say that the result does not taste at such a recipe, but if it all points to a correct ciabatta is satisfied questionable. If you have no time, rather buy a good bread with a good baker. Even in Italy, the least you ciabatta bread honestly bake at home, but buy this fresh from a professional. 1. Let the dough time! I've already mentioned? Right, but this point can not repeat often enough! Underestimate the stickiness of the dough at any time. Although it no longer feels towards the end so he likes to stick to the rising of work or foil. So Mehlt necessarily all good one! 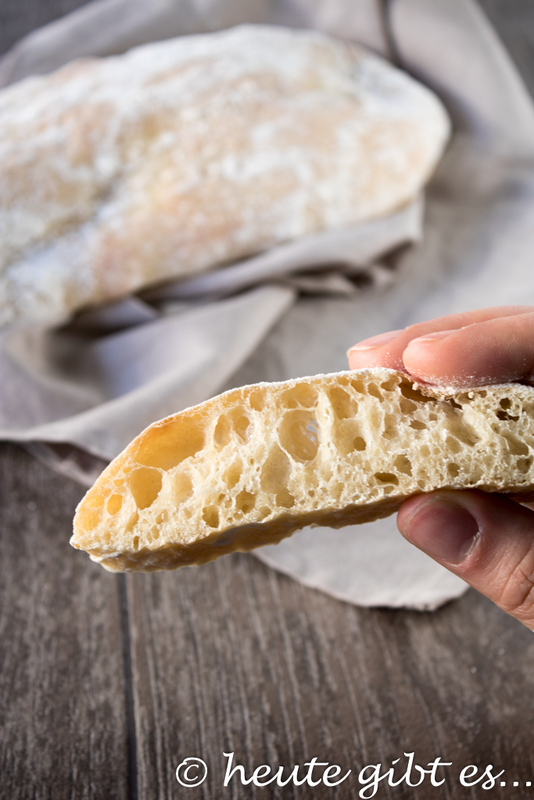 When ciabatta baking gases form over several steps in the dough, which are responsible for the well-known pores later. For this, it must rise several times and folded accordingly in one step. Are the shapes and lifting the loaves therefore particularly careful that you does not tear the dough and evacuate gases. The time invested was otherwise useless! This bread is very important that the oven at appropriate times has a certain temperature and the baking environment is wet or dry. Been taken into account necessarily the individual steps, as you otherwise will not get perfect crumb or crust. 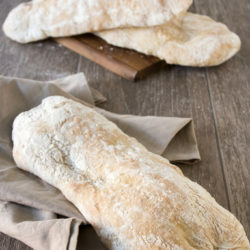 If you should have any concerns now is whether you get baked the even as a beginner, be reassured: Stay tuned exactly to the steps in the recipe and the above tips, then you will get certainly a perfect ciabatta! For the dough, the yeast dissolve in water and add along with the flour in a bowl. Everything well with a spoon stir until a clump-free, homogeneous mass, cover with plastic wrap and let rest for 3 hours at room temperature. For the main dough dissolve the yeast and sugar in the water. Then stir the dough with the beater of the kitchen machine and alternately add flour and yeast solution. Once the ingredients are well mixed, use the dough hook attachment and knead for 5 minutes. Then add the salt, the dough further 7 minutes knead, cover bowl with plastic wrap and let rest at room temperature for one hour. and sprinkle with flour after leavening the dough on a well floured surface. Now it depends on the right folding technique to: Specifies a long side to about 3.2 over the dough, then beat first the opposite side and finally the other two sides (see pictures). Parts then the dough into 5 equal pieces. The loaves of bread with the seam lay down on a well-floured surface, Sprinkle with flour, cover with plastic wrap and let rise for about 90 minutes at room temperature. The volume should have this doubled to time. Preheat oven to 240 ° C (top and bottom heat). The baking sheet on which the Ciabatte to be baked later, this warm in the oven. Now take the loaves one after carefully from the work surface, place on a baking paper strips upside down and gently pull in the length. Concern, in carefully so that the gas formed during the rise does not escape in the dough. Place the baking paper with the Ciabatte on the hot baking sheet and spread before closing the oven 5-6 times water with a spray bottle in the interior, so that a hot, moist environment is created. After 8 minutes, reducing the temperature to 200 ° C and bake for a further 8 minutes. (After 5 minutes) Here, in the last 3 minutes clamping a wooden spoon between the oven door and oven so that moisture can leak. Cool the finished loaves on a baking rack and enjoy. In Italy, a mix of Manitoba flour and wheat flour type 00 in the ratio 2 is often called flour: 1. The Manitoba flour is often obtained only Germany online. But you can without problems even wheat flour type 405 use, which is very good on the result as well! Of course you can knead the dough without food processor. The kneading times should then be extended in any case. Due to the stickiness of dough, especially when the use of a spatula is recommended at the beginning. spares no flour in the processing of the dough! There is nothing worse than that enough gases have formed in the dough and these escape again, because the dough from sticking to the work surface and tears. 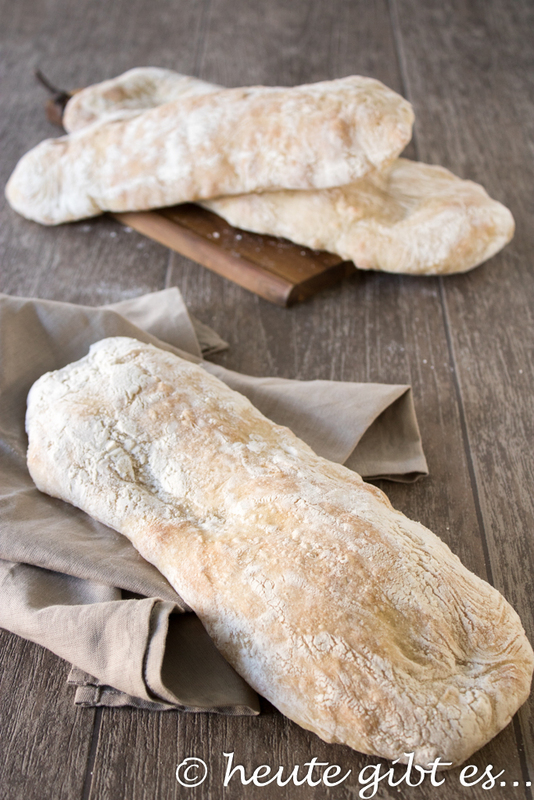 If you small ciabatta loaves want, you can receive up to 10 small ciabatta from the dough. The white bread sticks about 2 days fresh. 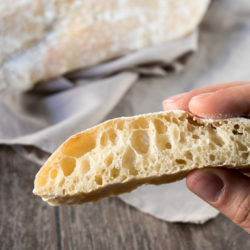 Dried ciabatta can be moistened either with a little water and baked or serve as discs for bruschetta. 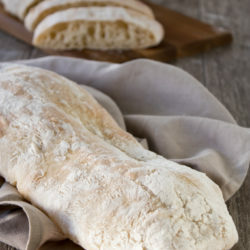 Ciabatta bread can be frozen for 3-4 months. If necessary, just about 15 minutes at 150 ° C freshen (preheated oven, conventional oven). Ok, I'll admit that the effort in this bread is not low. but if you have no bakery near you that sells the bread and it does not taste good there, well worth the effort in my opinion already. There is admittedly no bread for days, but now and then there will now be the freshly baked with us in the future. Enjoy your ciabatta as tasty Panino. Assigned it to taste and feel like in Italy. To barbecues which is the ideal accompaniment to meat and vegetables. It fits perfectly with this example, Salad of grilled vegetables! Cuts the ciabatta into slices and prepares delicious crostini or bruschetta to. Here, the bread may be slightly dry. is also very popular with us the use of bread for this crunchy panzanella (italienischer Brotsalat). You see, this bread is very versatile! 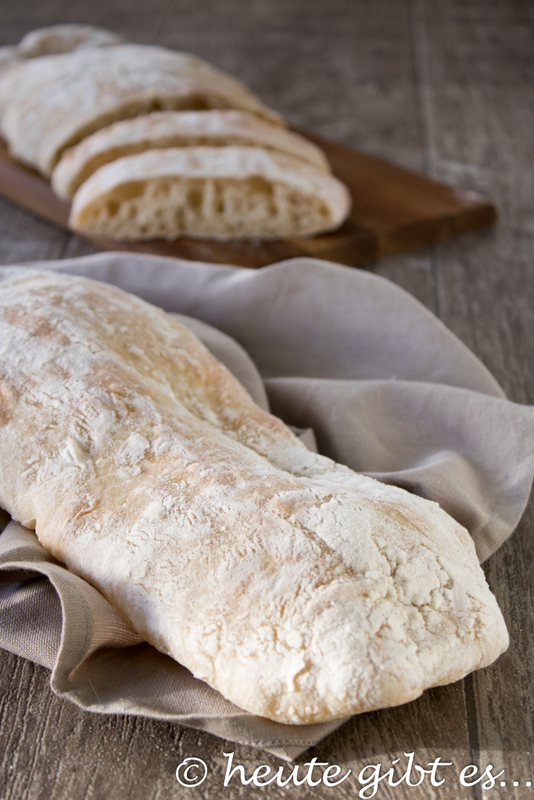 Have you ever ciabatta even prepared? Ran it all smoothly or have you also had bad experiences in bread made? Tell me about your experiences, I'm excited! 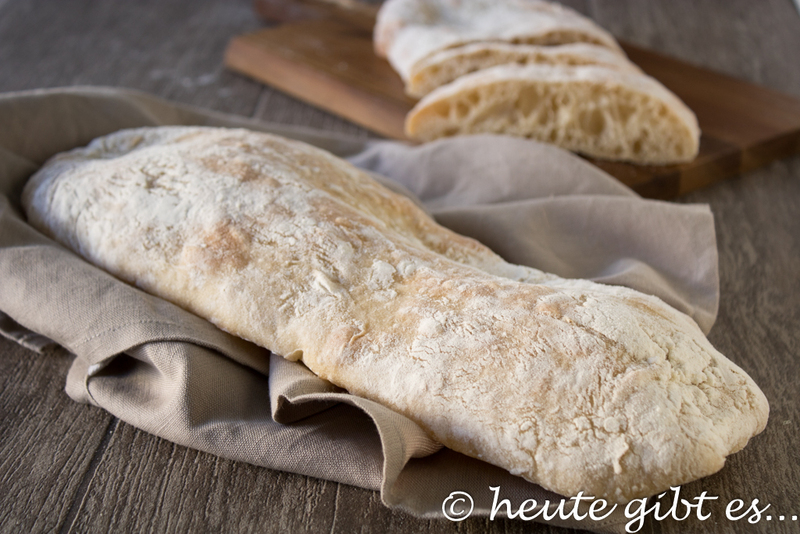 6 Kommentare zu "Ciabatta – Italian bread classics"
Very great, thanks for the great tutorial, looks great and I will try that. Gladly 🙂 Have fun trying! 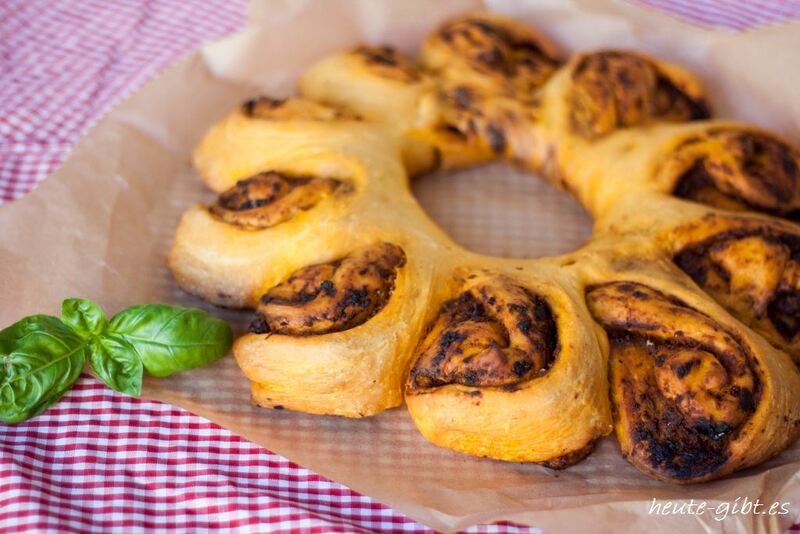 nice that you have succeeded this 🙂 The version with dried tomatoes and olives sounds delicious!